Crosstalk is a significant factor that can cause electromagnetic interference issues. In modern electronics, crosstalk (XT) is defined as any phenomenon by which a signal transmitted on one signal line of a transmission system creates a noise or unwanted effects in another signal line or channel.Typically, crosstalk is caused by distributed capacitive, inductive, or conductive coupling, which is usually hard to model through equivalent circuit models. 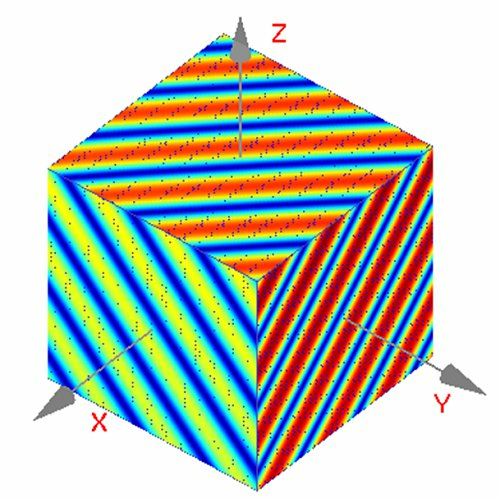 Thus a full-wave simulation is often required to capture such effects. The following example demonstrates the capability of Wavenology EM in simulating crosstalk effects in complex IC packages. Fig. 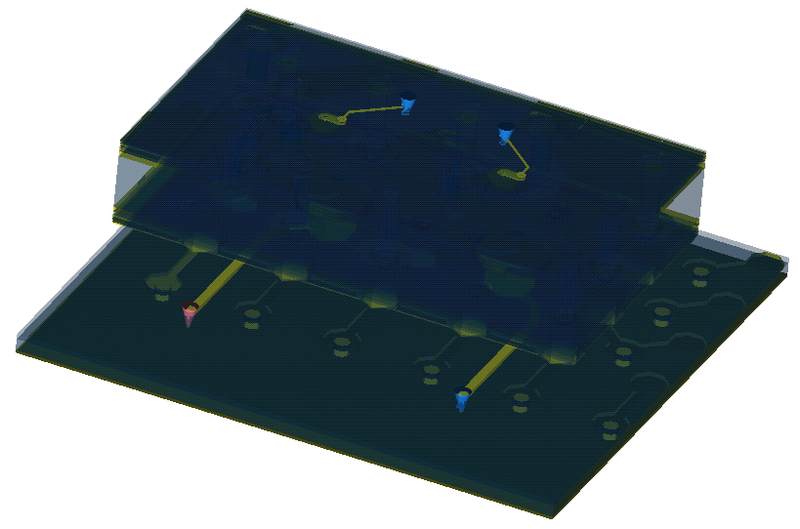 1 demonstrates the model to be simulated, it is part of a 8-layer board in the IC package, where the left figure shows the entire model with substrate displayed, and the right figure shows the layout of the metal structure, including ground plane, vias and signal lines. As can be seen, only two signal lines are put into this example. Four lumped ports are placed at the both terminals of the two signal lines. Fig. 1. Part of the IC package model. Left is view with substrate displayed, right is metal lines inside. The model was simulated with Wavenology EM. A wideband BHW signal with 30 GHz bandwidth is applied at terminal 1 marked as the red lumped port shown in Fig. 1 right. The transient scattered voltage signal on the four terminals are displayed in Fig. 2 left, where clear transient crosstalk signals can be observed in black and green curves. The S-parameters of the four lumped ports are displayed in Fig. 2 right, from which it is observed that from approximately 0-20 GHz, the signal is transmitted and received well. However, there is a big “sink” of S11 at around 26 GHz. And at this frequency, the energy of the signal did not go through terminal 2, but raised the signal level of terminal 3 and 4 which are terminals of the other signal line, as illustrated in Fig. 2 right. Fig. 2. 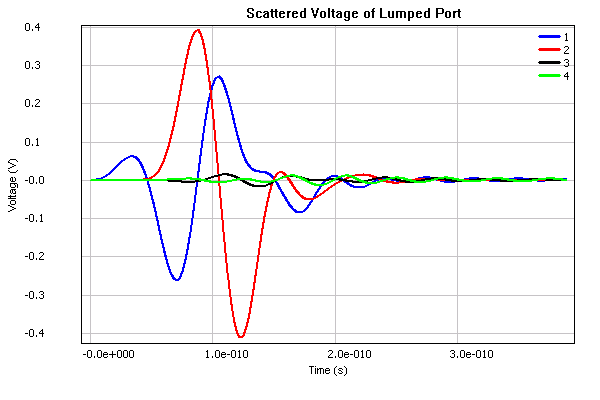 Left: Transient scattered voltage on the four lumped ports. Right: S-parameters of the four lumped ports. To further investigate where and how is the energy at 26 GHz going through the transmission system. A snapshot of the surface current is simulated by Wavenology EM, as shown in Fig. 3. From the animation, it is clear that the major portion of the input signal energy go through the signal line. However, resonances is clearly observed among the supporting bars between the layers. Such resonance stores the energy of the input signal at 26 GHz. And raise up the crosstalk level to terminals 3 and 4. Fig. 3. Snapshot of the current flow along the signal line and the coupling effect. A radome (Generated by radar and dome) is a structural enclosure that protects RF devices from being exposed to the outside damaging environment (weatherproof). The design of radome typically contains a hard shell, which has strong properties against physical damage. While in the meantime, such shell should minimally the distort the electromagnetic signal transmitted or received by the antenna inside. In other words, the radome should be transparent to radar or EM waves. Fig. 5. Setup the near-field ingestion. Fig. 7. E field distribution on ingestion faces (800 MHz). Fig. 9. 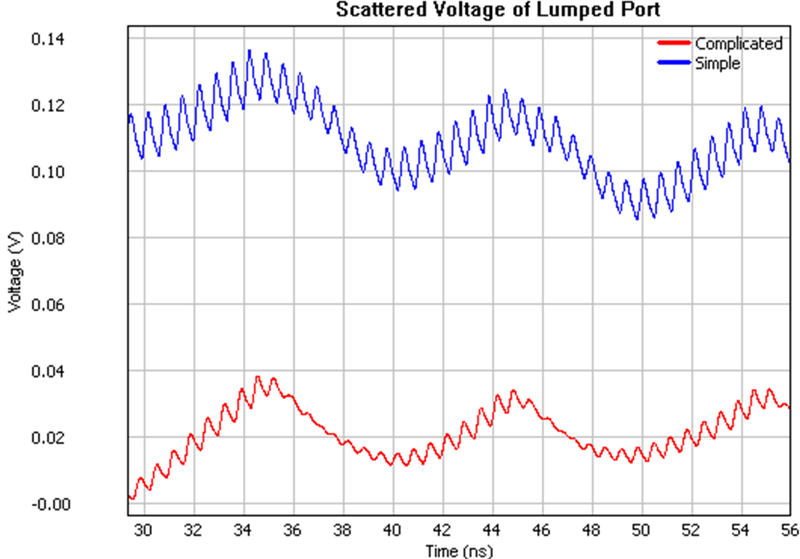 Time domain signal received at the lumped port terminal. Fig. 10. Snapshots of field penetration through the radome. This example shows a Wavenology EM simulation of a complicated multiple-channel communication system which is more realistic. 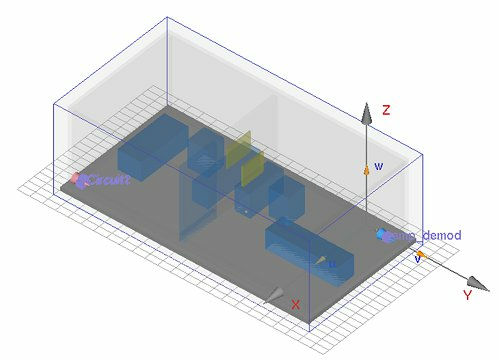 The simulation mimics a home environment which contains furniture and walls. And capture the impacts of such structures on wireless communications. 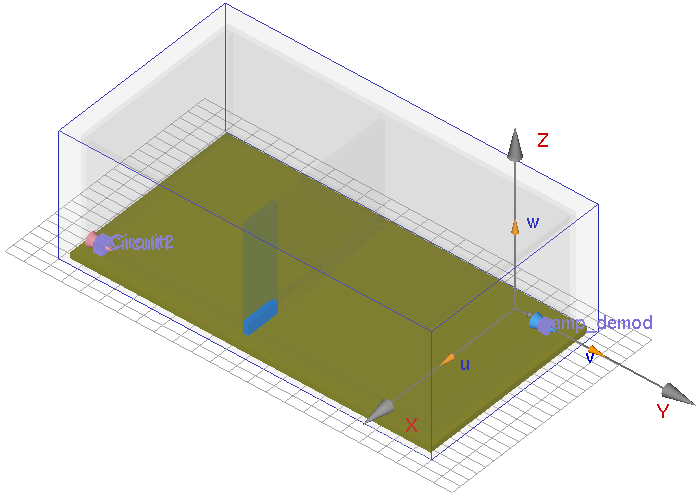 For comparison, two room configurations are modeled in Wavenology EM, a simple room layout shown in Fig. 11 left and a furnished room layout shown in Fig. 11 right. Due to complex objects including wall and soil, traveling signal can be reflected and decay. 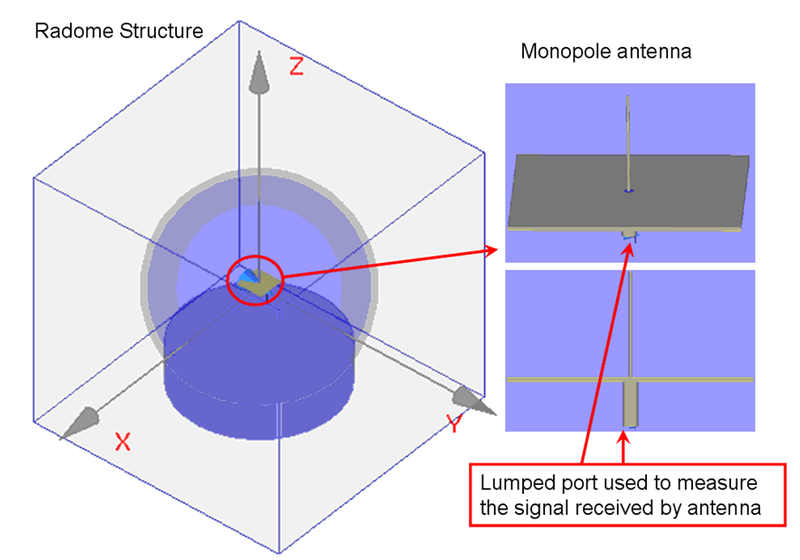 The transmitting and receiving antennas are shown in Fig. 12, which are put in the two corners of both simple and complex configured rooms, respectively. The modulate and de-modulate circuitries are illustrated in Fig. 13. Fig. 14 shows demodulated signals filtered by the demodulator from both simple and complex configured rooms. As seen in the results, furnished room will diffract the wireless signal and leads to a weak receiving, optimal layout with furniture in different positions of the room can be tried for the improvement of wireless communication efficiency. Fig. 15 shows the snapshot of the field propagation. 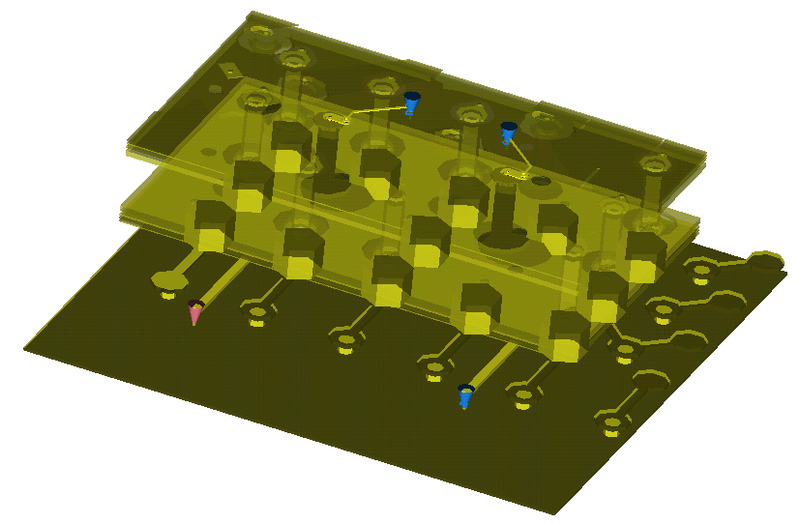 From this simulation, we also confirm that Wavenology EM combined with the nonlinear SPICE solver can analyze or design complicated multiple-channel communication systems. Fig. 11. Multiple-channel communication room which has a dimensions of 3.2 m x 6.2 m x 2.0 m. Left: Simple configured. Right: Complex configured. Fig. 12. Model of the communication system including transmitter (left) and receiver (right). The substrate in the transmitter has a dimension of 76 mm x 1.5875 mm x 79.5 mm and a dielectric constant of 4.24. The receiver is located about 500 mm away from the transmitter. Fig. 13. SPICE circuits in the communication system. (a) Modulation circuit denoted as Circuit1 and Circuit2 in the transmitter; (b) Demodulation circuit in the receiver. Fig. 14. 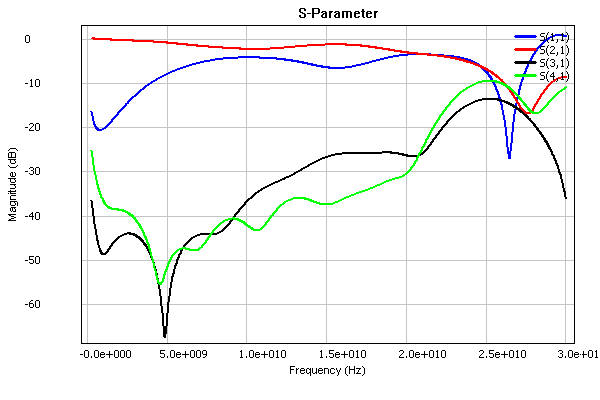 Demodulated signal filtered by the demodulator in the receiver. Fig. 15. Snapshot of the field propagation from transmitter to receiver.